Background: Bilioenteric anastomoses are commonly performed as a part of liver transplantation, reconstruction of the common bile duct following resection of benign and malignant tumors, congenital biliary malformations and traumatic injury. Anastomotic ischemia plays an important role in both short and long-term complications related to bilioenteric anastomoses. We describe a catheter-based, suture-free approach to bilioenteric anastomosis that reduces or eliminates factors that contribute to ischemia including trauma from duct manipulation, anastomosis tension and compression and retained foreign materials. The device is easy to use and its unique design avoids direct compression of the duct or trauma from sutures and duct manipulation. Materials and Methods: A hepaticojejunostomy was performed in two pigs using a catheter-based device and euthanized at 10-14 days for follow-up imaging and gross inspection of the anastomosis. Application of the device includes percutaneous introduction of a catheter through the common bile duct transected 2-3 cm from the liver. The catheter is advanced into the jejunum through a 5-8mm eneterotomy where an umbrella anchoring device is deployed. The bowel is drawn up in apposition to the transected duct over the percutaneous catheter which serves as an internal stent. The catheter and anchoring devices are secured with the capability to perform cholangiography for anastomosis surveillance. Results: The procedure was well tolerated by the study animals with no evidence of bilioenteric anastomotic leak on cholangiogram studies. Gross inspection revealed a secure, sealed and patent anastomosis with no intraperitoneal evidence of bile leak. 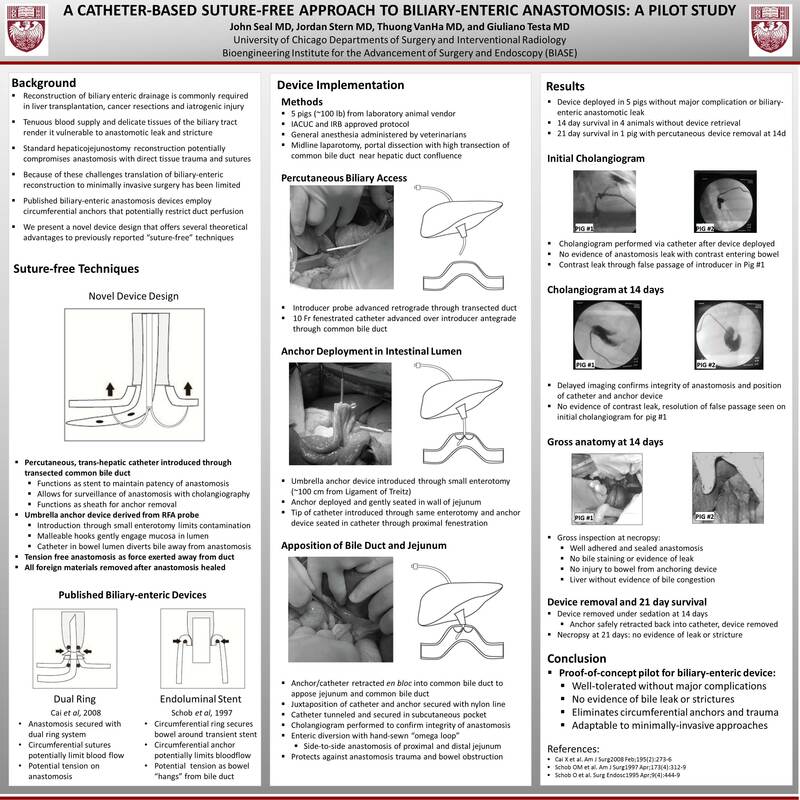 Conclusion: This alternative catheter-based approach to bilioenteric anastomoses is safe and effective and offers potential advantages over traditional approaches by reducing anastomotic ischemia. Furthermore, the device is well suited to be deployed using laparoscopic and endoscopic approaches in the future.